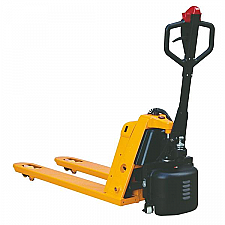 Electric Pallet Trucks - Great To Reduce Your Workforce’s Exertion! A recent study was conducted by independent researchers into the required effort to use a hand pallet truck. In this study researchers tested seventeen different brands of hand pallet truck in order to obtain results which formed an accurate average. Each brand was tested with a range of loads ranging from 500Kg to 2500Kg. Not only were the results conclusive, they were also shocking, proving the fact that electric pallet trucks are a great piece of equipment to increase productivity and reduce the effort required by your workforce. In order to start a 500Kg load from a stationary position, requires on average an effort of 23.3Kg from the operator. When this load is increased to 2000Kg the required force increases to 49.6Kg, this figure is much greater than those specified as being safe in official guidelines. Additionally the results were equally shocking when it came to the required force to raise loads. In order for an individual operator to raise a forklift load of 2000Kg requires a considerable amount of exertion, the study revealed it took an average force of 35.1Kg, and again this is much higher than the official guidelines. Even the effort required for an operator to keep a 2000Kg load in motion, 30.7 Kg, exceeds the guidelines by a shocking 53.1%. In order to alleviate this problem in your workforce without having to compromise on productivity you should consider making use of electric pallet trucks. Electric pallet trucks compensate for the operator by providing the majority of the effort required to move and lift these loads. What should I look for when purchasing an electric pallet truck? When you are looking to purchase electric pallet trucks there are a number of factors which you should consider. Primarily you should seek to purchase your electric pallet trucks from a reputable brand. When you purchase from a reputable brand not only is the quality of construction superior, but the dealer will also be able to provide you with insightful advice in the practical operation of your new trucks. This practical advice may include selecting the optimum type of tyres. This may seem trivial but can make a dramatic difference, to demonstrate softer tyre types are more effective on slippery surfaces but will wear far more quickly. Linked castor wheels: this provides the maximum levels of stability even with heavy loads and also when performing sharp turns. A tiller arm which always returns to the upright position. Performance modes which can be easily switched: this enables operators to change modes instantly to one which best suits their driving ability and operating conditions. A generous lifting height: this option can prove especially useful in docking areas, ramps and loading bays, especially when moving damaged pallets. Heavy duty forks: these provide far greater levels of durability thus increasing the longevity of your truck. A closed chassis: this prevents dirt and water from getting into the truck, which in turn results in fewer repairs and a longer working life. This entry was posted in Handling Equipment and tagged electric pallet truck on November 19, 2013 by admin.